SOURCE: flickr.com/jstephenconn The Scopes trial historical marker in front of the Rhea County Courthouse, Dayton, Tennessee. Legislators in South Dakota seem bent on becoming anti-science pioneers. After a century of anti-evolution policies and legislation across the United States, the South Dakota legislature is set to become the only one in the nation to micromanage what teachers should say about global warming. Kovacs later apologized, explaining, “My ‘Scopes monkey’ analogy was inappropriate,” as it undermined his insistence that the Chamber “is not denying or otherwise challenging the science behind global climate change.” However embarrassing and erroneous Kovacs’ description of the chamber’s campaign might have been, they foreshadowed the South Dakota legislature’s move toward its own version of a global warming Scopes trial. The Scopes trial of 1925 grew out of the first great anti-science movement of the 20th century: creationism. 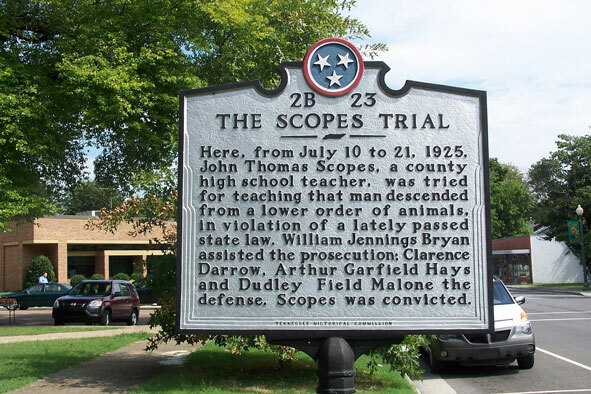 John Scopes was convicted of violating a Tennessee law forbidding teachers “to teach any theory that denies the story of the Divine Creation of man as taught in the Bible.” Similar bills remained on the books until the 1960s, when the U.S. Supreme Court ruled them unconstitutional. Creationists soon adopted a new strategy, with laws in Louisiana and Arkansas requiring “balanced treatment” of evolution and creationism. Both bills were declared unconstitutional in the 1980s. Creationists have not given up. Some have recently partnered with global warming deniers to demand “academic freedom” for public school science teachers to depart from generally accepted science when discussing supposedly controversial scientific topics. In the last two years, a dozen states have considered such bills, some (including Louisiana’s—the only one to pass into law) naming global warming and evolution along with human cloning or stem cell research as especially controversial. These topics are notable for being subject to intense political dispute without any question in the scientific community about the underlying science. To make clear what that balance would entail, the 33 sponsors of HCR 1009 cited widely debunked claims of climate change deniers. They presented vineyards in Greenland as evidence that our modern warming is unremarkable; in fact, the Medieval Warm Period they point to appears to have been a local phenomenon and unlike the current warming, was not driven by atmospheric carbon dioxide produced by human activities. They offer “shifting warm water currents” as an alternative explanation for the dramatic decline in Arctic sea ice; actually, such shifts are predicted consequences of global warming. They repeat the widely mocked claim that carbon dioxide is “the gas of life,” and therefore not a dangerous pollutant; this despite more than a century’s documentation that the gas traps heat in the air. They cite a deeply flawed petition organized by climate change deniers as if science were determined by plebiscite; instead they should have looked to published research, where researcher Naomi Oreskes has found near unanimity that global warming is happening and largely results from human activities. When the bill reached the Senate floor on February 24, it was amended to strike most of the scientifically erroneous justifications. South Dakota’s teachers and even a few of its legislators know better than to repeat the creationist canard of equating a theory with uncertainty. As the state’s science standards explain, a theory is “an explanation for some phenomenon that is based on observation, experimentation, and reasoning”—a way to explain facts, which are merely “statement[s] or assertion[s] of verifiable information.” The stars were not aligned for the puzzling references to “astrological” and “thermological” explanations for global warming, and some legislator must have seen the irony of decrying politically biased science while seeking to legislate a scientific result. But the Senate strengthened the final line, insisting now that teachers offer a “balanced and objective” presentation of global warming. However reasonable such advice may be in the abstract, the effect of the law will be chilling to teachers on the ground. Science is not and should not be resolved through the legislative process, and the details of what teachers present as science should not be dictated by legislators with no experience as scientists or teachers. If the revised bill passes the House, it will put the hardworking teachers of South Dakota in a bind. Will they bow to political pressure and misinform their students about global warming? Or will they soldier on, preparing their students to understand the climatic forces driving the breadbasket from Kansas to the Dakotas and expanding the market for South Dakota’s abundant wind power? If that is the case, it may take a latter-day John Scopes to shoulder the burden of public ignominy, defend the integrity of science education, and show the South Dakota legislature the error of its ways. Joshua Rosenau is the Public Information Project Director at the National Center for Science Education. Legislators in South Dakota seem bent on becoming anti-science pioneers. After a century of anti-evolution policies and legislation across the United States, the South Dakota legislature is set to become the only one in the nation to micromanage what teachers should say about global warming. This attack on global warming was prefigured in the announcement last August by the U.S. Chamber of Commerce that it planned to gin up “the Scopes monkey trial of the 21st century.” Senior vice president for the environment William Kovacs exulted: “It would be evolution versus creationism. It would be the science of climate change on trial.” Kovacs later apologized, explaining, “My ‘Scopes monkey’ analogy was inappropriate,” as it undermined his insistence that the Chamber “is not denying or otherwise challenging the science behind global climate change.” However embarrassing and erroneous Kovacs’ description of the chamber’s campaign might have been, they foreshadowed the South Dakota legislature’s move toward its own version of a global warming Scopes trial. The Scopes trial of 1925 grew out of the first great anti-science movement of the 20th century: creationism. John Scopes was convicted of violating a Tennessee law forbidding teachers “to teach any theory that denies the story of the Divine Creation of man as taught in the Bible.” Similar bills remained on the books until the 1960s, when the U.S. Supreme Court ruled them unconstitutional. Creationists soon adopted a new strategy, with laws in Louisiana and Arkansas requiring “balanced treatment” of evolution and creationism. Both bills were declared unconstitutional in the 1980s. Creationists have not given up. Some have recently partnered with global warming deniers to demand “academic freedom” for public school science teachers to depart from generally accepted science when discussing supposedly controversial scientific topics. In the last two years, a dozen states have considered such bills, some (including Louisiana’s—the only one to pass into law) naming global warming and evolution along with human cloning or stem cell research as especially controversial. These topics are notable for being subject to intense political dispute without any question in the scientific community about the underlying science. South Dakota’s HCR 1009 is the first bill to attack global warming only, and is especially notable for its attempt to resurrect the creationist “balanced treatment” strategy of the 1980s. As it passed the South Dakota House on February 17, the resolution calls “for balanced teaching of global warming in the public schools of South Dakota.” To make clear what that balance would entail, the 33 sponsors of HCR 1009 cited widely debunked claims of climate change deniers. They presented vineyards in Greenland as evidence that our modern warming is unremarkable; in fact, the Medieval Warm Period they point to appears to have been a local phenomenon and unlike the current warming, was not driven by atmospheric carbon dioxide produced by human activities. They offer “shifting warm water currents” as an alternative explanation for the dramatic decline in Arctic sea ice; actually, such shifts are predicted consequences of global warming. They repeat the widely mocked claim that carbon dioxide is “the gas of life,” and therefore not a dangerous pollutant; this despite more than a century’s documentation that the gas traps heat in the air. They cite a deeply flawed petition organized by climate change deniers as if science were determined by plebiscite; instead they should have looked to published research, where researcher Naomi Oreskes has found near unanimity that global warming is happening and largely results from human activities. The resolution invokes these fallacious claims in the service of four points: “That global warming is a scientific theory rather than a proven fact”; “That there are a variety of climatological, meteorological, astrological, thermological, cosmological, and ecological dynamics that can effect [sic] world weather phenomena and that the significance and interrelativity [sic] of these factors is largely speculative”; “That the debate on global warming has subsumed political and philosophical viewpoints which have complicated and prejudiced the scientific investigation of global warming phenomena”; and that instruction about global warming should be “appropriate to the age and academic development of the student and to the prevailing classroom circumstances.” When the bill reached the Senate floor on February 24, it was amended to strike most of the scientifically erroneous justifications. South Dakota’s teachers and even a few of its legislators know better than to repeat the creationist canard of equating a theory with uncertainty. As the state’s science standards explain, a theory is “an explanation for some phenomenon that is based on observation, experimentation, and reasoning”—a way to explain facts, which are merely “statement[s] or assertion[s] of verifiable information.” The stars were not aligned for the puzzling references to “astrological” and “thermological” explanations for global warming, and some legislator must have seen the irony of decrying politically biased science while seeking to legislate a scientific result. But the Senate strengthened the final line, insisting now that teachers offer a “balanced and objective” presentation of global warming. However reasonable such advice may be in the abstract, the effect of the law will be chilling to teachers on the ground. Science is not and should not be resolved through the legislative process, and the details of what teachers present as science should not be dictated by legislators with no experience as scientists or teachers. If the revised bill passes the House, it will put the hardworking teachers of South Dakota in a bind. Will they bow to political pressure and misinform their students about global warming? Or will they soldier on, preparing their students to understand the climatic forces driving the breadbasket from Kansas to the Dakotas and expanding the market for South Dakota’s abundant wind power? If that is the case, it may take a latter-day John Scopes to shoulder the burden of public ignominy, defend the integrity of science education, and show the South Dakota legislature the error of its ways. Joshua Rosenau is the Public Information Project Director at the National Center for Science Education.